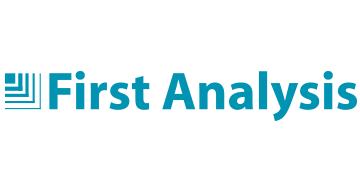 Founded in 1981, Chicago-based First Analysis has a 30-year record of serving emerging growth companies, established industry leaders, and institutional investors in its focused areas of domain expertise, both through its private growth-equity activities and through First Analysis Securities Corp. (FASC), which provides investment banking services and institutional equity research. FASC is a FINRA-registered broker-dealer and member SIPC. First Analysis applies a differentiated strategy: achieving broad, deep, and long-term domain expertise through a research and investment focus that encompasses both private and public companies. Its research-focused investment professionals develop and maintain deep domain expertise in specific sectors, each of which belongs to one of First Analysis's core areas of focus: health care, technology/SaaS, services, and clean-tech/chemicals.